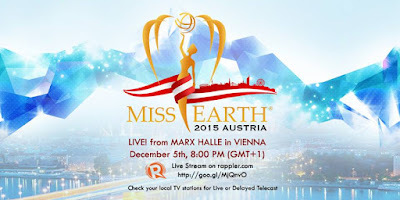 Miss Earth 2015 Coronation Night will be held at Vienna Austria on December 5, 2015 at 8:15 pm (which is at 3:15 am, December 6 in Manila, Philippines). Miss Earth 2014 Jamie Herrell from the Philippines will be crowning her successor in a few hours. Angelia Ong is representing the Philippines at the 15th edition of Miss Earth.